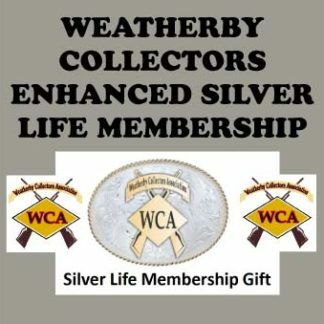 View cart “Enhanced Gold Life Membership” has been added to your cart. 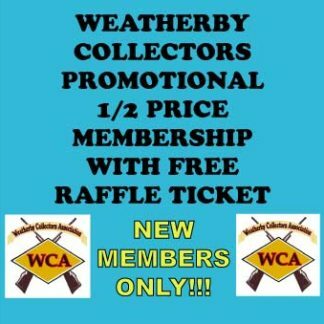 The Weatherby Collectors Association is now offering members a new opportunity to help support the WCA even further with two additional levels of Life Membership. One of the two new levels of Life Membership is the “Gold Life Membership”. The Gold Life Membership includes a personalized plaque and a custom, limited edition #124 Buck Knife (Lucite handle and WCA logo engraved in the blade) as gifts. 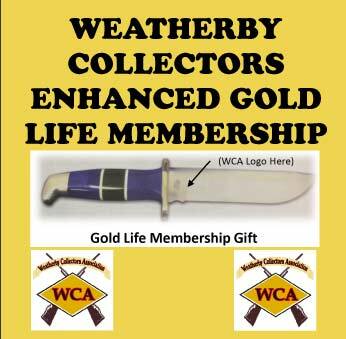 The Gold Life Membership can be achieved by an additional contribution of $1,000 to the WCA on top of your existing WCA Life Membership (must already be a current life member or also purchase life membership in addition to enhanced life membership). There are only 10 of these knives available so don’t wait!